Excellent for pumping in industrial chemical applications, including high purity and high temperature applications. 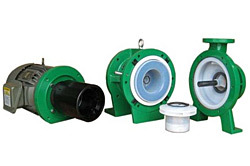 Magnatex®/Texel® MTA Series sealless, mag-drive pumps feature a transfer molded, mechanically attached PFA lining moulded @1200psi that is thicker and more uniform than our competitors' roto-molded linings. Ideal for almost all industrial chemical applications including high purity and elevated temperature applications, our pumps offer many enhanced characteristics over the competition. 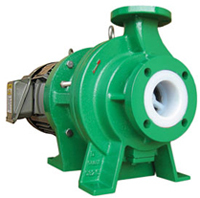 MTA Series pumps conform to ANSI B73.3 Standards. Sealless design helps eliminate "Reportable Release" issues. PFA (Perfluoroalkoxyalkanes) is a high strength, high temperature and abrasion resistant fluoropolymer material. Standard lining thickness is 5-6 mm. PFA lining is mechanically secured to the ductile iron casing armoring by means of recessed dovetails which are cast into the ductile iron casing armor. Extra long main shaft bushing. Proprietary high pressure (1200 psi) transfer molding process. Completely seamless inner magnet lining. High pressure transfer molding @ 1200psi produces a lining with a dense, uniform thickness and superior surface finish, all of which contribute to superior service life in demanding chemical services. High pressure molding also eliminates any air pockets between the casing lining and the armoring, which is critical in high temperature services. Competitors use a cheaper, atmospheric pressure, rotomolding process which results in a thinner, less dense, more permeable lining material with a less uniform surface finish. Rotomolded linings may have air bubbles trapped behind them which can lead to cracked linings in high temperature applications. Magnatex PFA linings are 5-6mm thick and therefore will last longer in service than thinner ones of the same material and even longer when compared to the ETFE and PVDF linings offered by most of our competitors. Most competitors' linings are just 3-4 mm thick which means they have proportionately less corrosion and permeation resistance than Magnatex lined pumps. High pressure molding at 1200 psi produces a positive locking of the lining material and prevents lining movement in high vacuum or low suction pressure applications. Most competitors have no mechanical means of restraining the casing liner which can result in lining movement in high vacuum or low suction pressure applications. 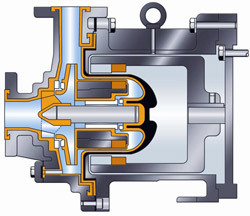 Shifting or movement of the lining may result in linings collapsing onto the internal rotating elements leading to catastrophic failure of the pump. PFA offers the broadest range of resistance to chemical attack, lowest permeation rate and highest temperature capability of all the fluoropolymer materials, which ensures the maximum possible service life for lined magnetic drive pumps. Generally only available in cheaper ETFE (Ethylenetetrafluoroethylene) material which has less chemical resistance, higher permeability and lower temperature resistance than PFA. The extra long main shaft bushing provides greater stability for operation across the entire hydraulic range of the pump, with smooth, quiet operation and extremely low vibration. Greater shaft support surface area means lower hydraulic loading, less wear and longer service life. Competitors generally offer shorter main shaft bushings resulting in a smaller surface area to support dynamic shaft loads. Less surface area, less pump life. Completely seamless inner magnet lining which eliminates any potential leak path for the process fluid to reach and attack the inner magnet. Most competitors have seams in the inner magnet lining that can allow aggressive chemicals to penetrate the lining which causes the magnet segments to swell and corrode, leading to catastrophic failure of the pump.